via Bangkok Post, 05 April 2018: Visiting Luang Prabang and finding the tomb of Henri Mouhot. I featured the tomb in one of my Instagram photos previously. If you have been to Luang Prabang, you probably have climbed the 300 steps up Phousi, the hill that stands in the middle of the town. From the top, you can see not just the breadth and length of the former Lao capital and a Unesco World Heritage site but also the Mekong River a stone’s throw to the west and the smaller Khan River nearby to the east. The two waterways meet just north of Phousi. Readers in Canberra may be interested in this public lecture by Brian Egloff on the Pak Ou Caves at Luang Prabang, Laos. The discussion follows more than two decades of investigation and conservation at the Tam Ting Caves, a Lao national heritage monument. The talk is set within the context of the role of UNESCO and ICOMOS in the protection of World Heritage and the illicit trade in cultural property. Members and the public are welcome: This is part of a series of talks organised by Australia ICOMOS. Please do pass this on to those who might be interested. Skulls in a pottery vessel recovered from Tham An Mah in Luang Prabang Province. 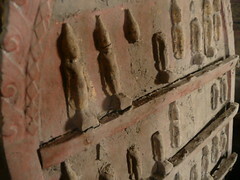 This iron age deposit was excavated by the Middle Mekong Archaeological Project in January 2010. One from my own fieldwork! A rock painting of a steamship at the Pak Ou Caves in Luang Prabang province, Laos. The painting is estimated to be about 100 years old. 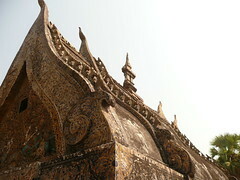 Two ancient capitals are named sister cities, following an agreement signed by Myanmar and Laos. Founded around the 8th century, Luang Prabang is a World Heritage Site that was the royal capital of the kingdom with the same name. 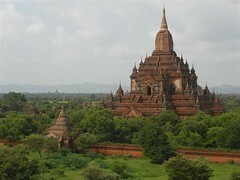 Bagan was founded in the 9th century but did not become the capital of the Burmese empire until the turn of the firt millenium. It is not a World Heritage Site because the military junta decided to muck up a lot of the restoration work on the many ancient structures that dot the landscape. The agreement to be sister cities is aimed at increasing tourist numbers.